So I had the privilege of visiting Listowel Eastdale to work with Becky Versteeg twice in October (yes – my posts are still rolling out from previous months!). Becky teaches grade 2 and she wanted to discuss moving forward with blogging. When I enter a classroom, the first thing I do is look at what has been posted on the walls. There were a few bulletin boards that caught my attention. The first board is shared in the hallway. The kids call it their Publishing Wall. The theme for the board “Work I’m Most Proud Of . . .”. Each student chooses what will be shared every week so that others may view and comment on their work. Love this idea – what a great way to make learning visible, share it with others, and invite collaborators to contribute their ideas! A natural introduction to blogging . . . The next display that caught my eye was a Pattern Curtain. Each student had made a pattern strip that they hung above the closet to act as a curtain – as more patterns strips are made the curtain begins to fill in. What a great alternative to a cloth curtain – make a curtain out of student work! The last bulletin board I wanted to share was the class “Feelings Wall”. Here the kids took pictures of themselves showing different emotions that were then posted as visual reminders to help kids express their feelings. Love it! Kids used iPads and the app Pic Collage. Becky had copied a piece of writing (a blog post for example) written by a student and pasted the text into a SMARTBoard file with their Writing Success Criteria at the bottom of the page. As the student read over his writing he worked through the checklist in front of the class. My favourite part? Becky then provided her feedback to the student in real-time on the SMARTBoard modelling how to give feedback -which not only shows kids what to expect when receiving feedback from her (strength and next step), but will later be revisited when we discuss how to comment on a blog. And because I was blown away by the collection of pumpkins in the front hallway at Eastdale I had to share! Every year the school hosts a pumpkin carving contest and the amount of community involvement is astounding. I was also told by a few staff that every staff and student dresses up – talk about school spirit! After the kids finished their tour of pumpkin paradise, Becky had her kids follow up with a curriculum-based activity that had kids using adjectives to describe the pumpkins they just saw. 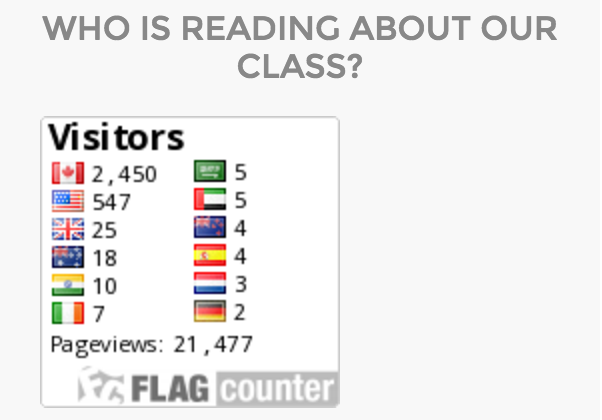 If you haven’t had a chance to check out Becky Versteeg’s Team2Eagles blog, you should – her class has had over 20,000 visitors to date!